← Otto’s new book is out – help him get it published! This August we went back to Yellowstone National Park for our third time, and if you’ve never been there, you should put it on your bucket list, you won’t be disappointed. 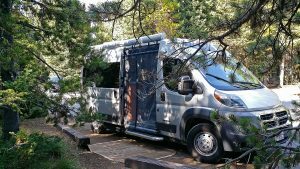 Instead of tent camping on this trip, we traveled in our small Roadtrek camper van which made things considerably easier for us. No setting up or taking down a tent for a change, but the rest of the experience wasn’t much different than before – it was as wonderful as ever. We stayed at Grant Village again, a campsite that is centrally located and very convenient for day excursions. 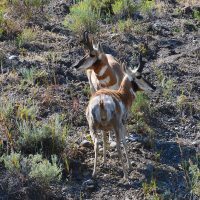 You can reserve a space, but all campsites are distributed by the park service when you arrive, and you cannot reserve specific sites in advance. Grant has a gas station, a store with a small quick-lunch counter, great free showers for camping guests, clean restrooms, and nice campsites. There is also a full-service restaurant there if the tasty burgers in the store’s restaurant don’t appeal to you. 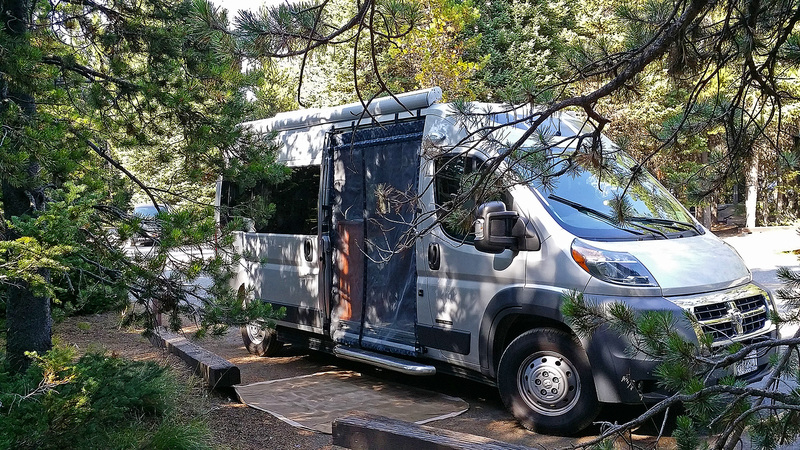 Although many campsites are close to each other, most of them allow enough room for setting up the necessities, and still give you some evening privacy. 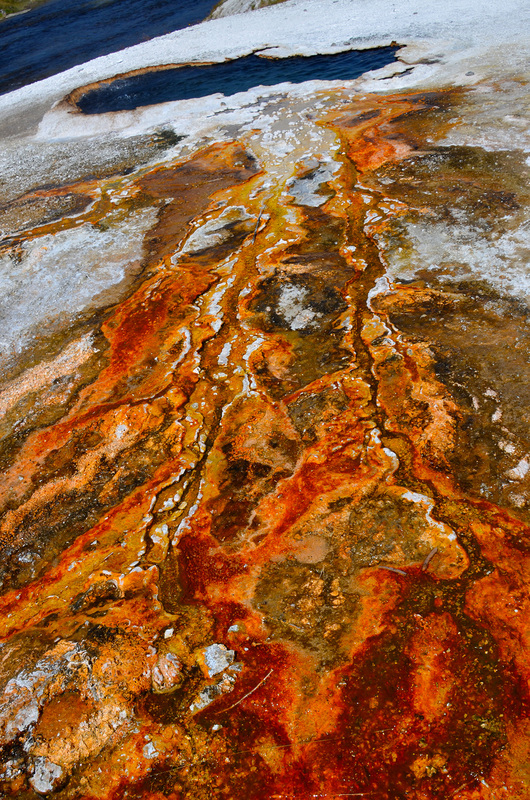 It seems like you learn something new every time you return to Yellowstone and this trip was no exception. 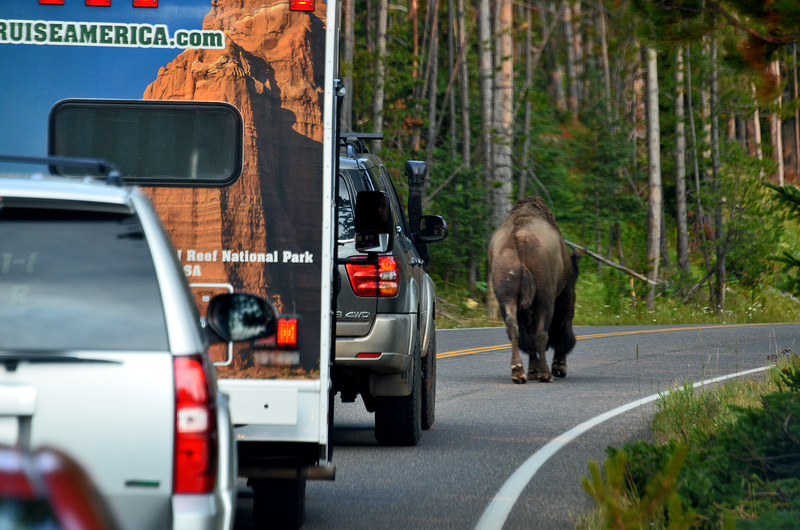 Mid-August is very busy in the park, and parking at most of the major attractions during mid-day can be complicated. We got around that problem by rising early each day, between six and seven am, driving to the area we wanted to visit, securing our parking space, and then having breakfast on site before moving on to the attractions. Visiting later or earlier in the year is recommended, even though the weather can be a problem, especially in late September when it may snow. 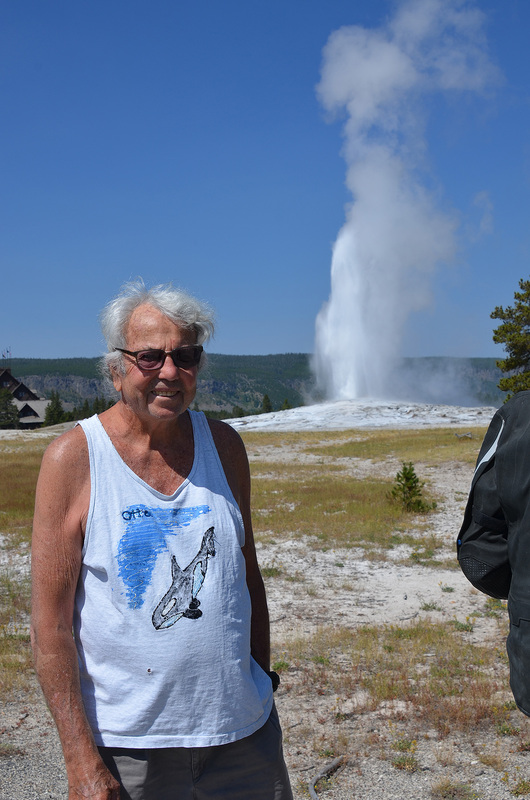 The morning of our first day was spent taking pictures at the geyser basin around Old Faithful, visiting the Old Faithful Lodge (nice restrooms! ), checking out the tourist shops, and reading the information signs to remind us that we were indeed right in the middle of a volcanic caldera. 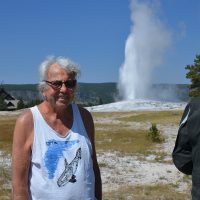 In the afternoon we stopped on the way back to Grant at West Thumb Basin for another geyser walk. 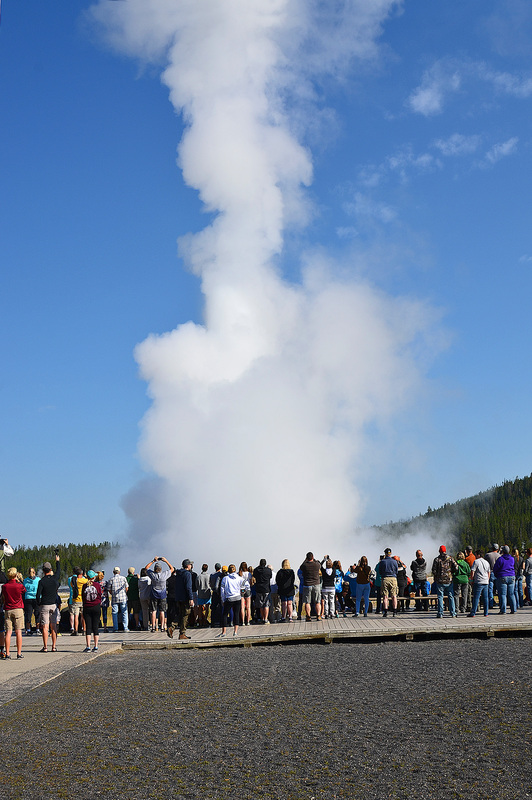 Not as spectacular as the Upper geyser basin where Old Faithful is located, but still an interesting walk, and no one seems to stay there for extended periods, so you can usually find parking. 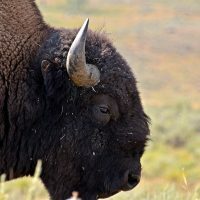 The next day we drove to Hayden Valley, home to the Yellowstone River and several herds of bison, almost guarantying quality pictures of wildlife. 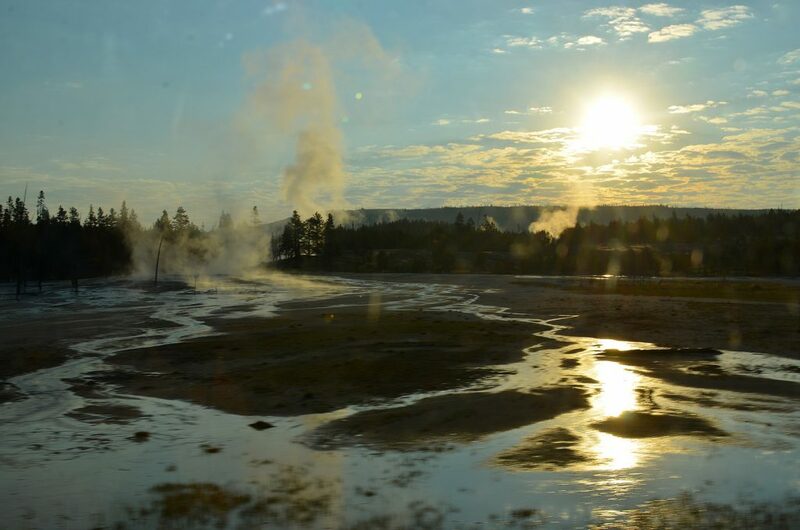 There are several other attractions in this area including the Grand Canyon of Yellowstone try (Inspiration Point or Artist Point), and of course the Yellowstone River where ducks, geese, and fishermen can be found. After leaving there, a visit to the area around the Fishing Bridge can round out your day. 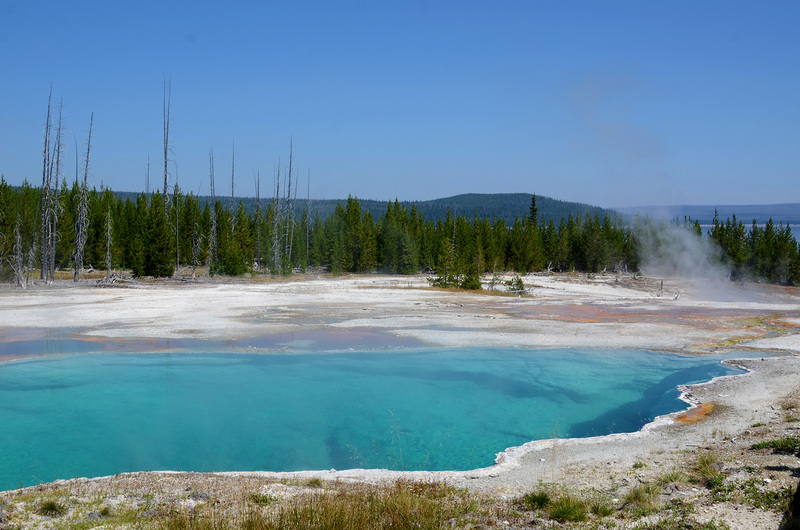 On our third day we drove back past Old Faithful to the Biscuit Basin, which features the Sapphire Pool and Mustard Spring along with a few other colorful geysers. 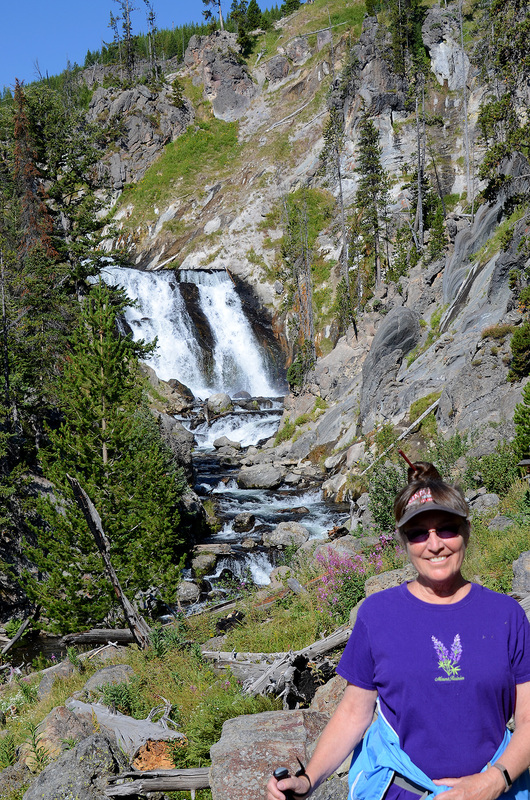 There is also a nice one-mile-long trail to see Mystic Falls on the Little Firehole River. This easy trail features some of the local flora and very nice views of the falls and the river along the way. 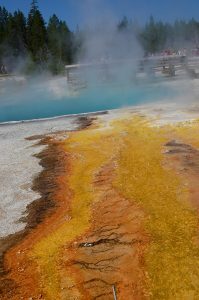 There are several other geyser basins in this area, and one can also chose several different trails if you want to stretch your legs a little farther. We spent our fourth day in Lamar Valley, and that was one of the best days of the trip. 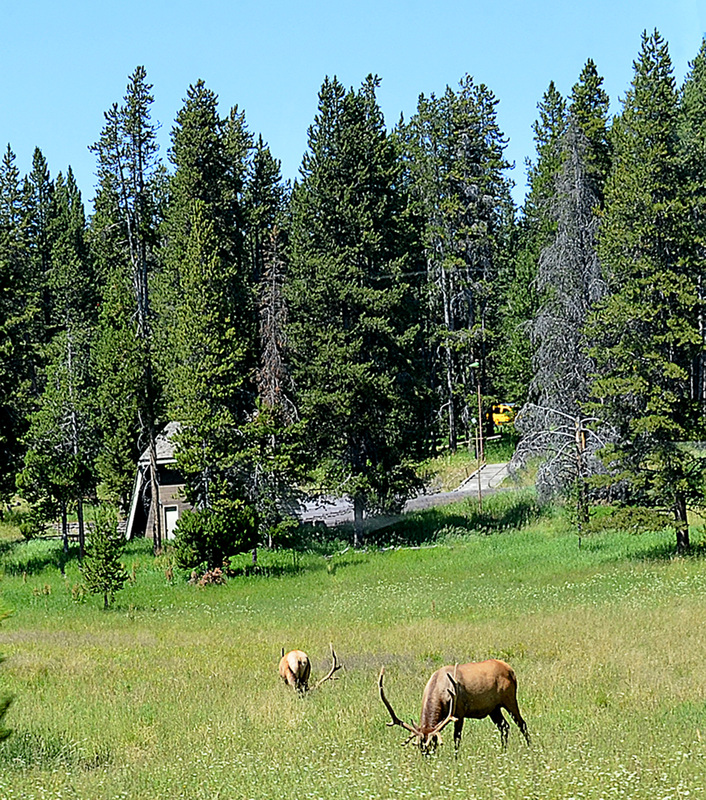 Lamar Valley is located by traveling through Hayden Valley past Canyon Village, over a range of hills on the Grand Loop Road, then down to a right-hand cutoff near the Roosevelt Lodge. 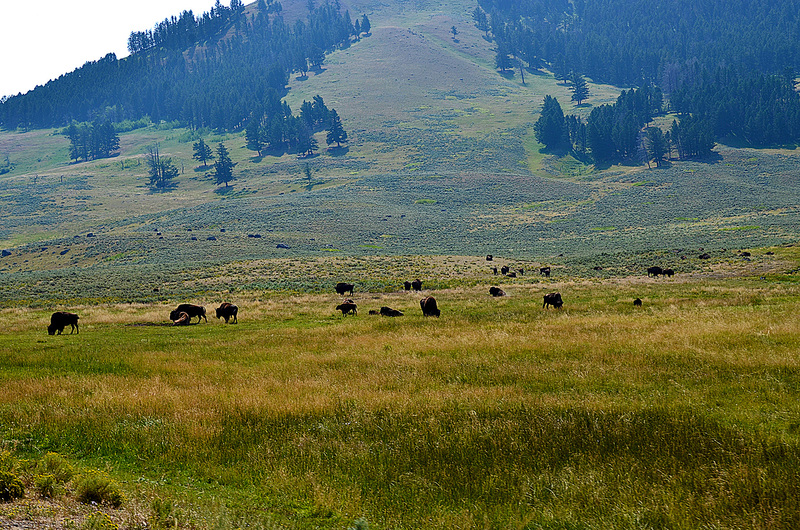 You’ll drive through another valley first before reaching the Lamar Valley. 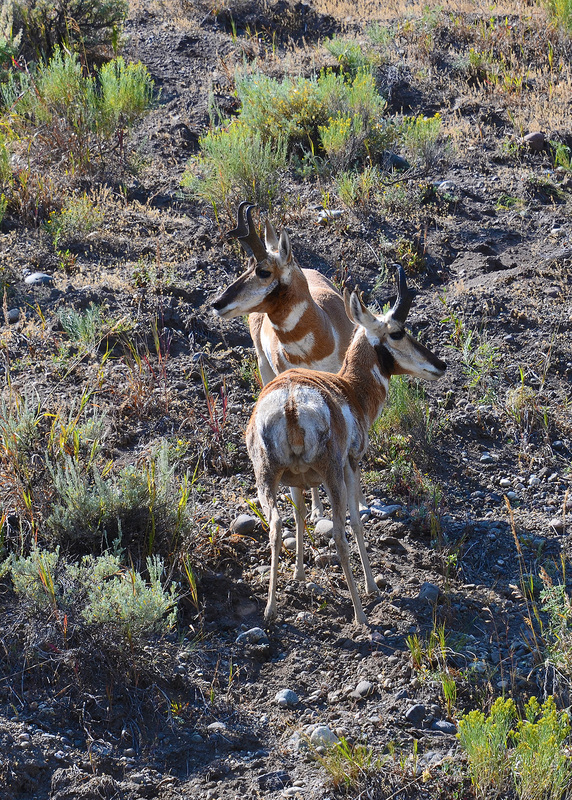 We saw herds of bison, antelope, and elk, but we didn’t see the wolves that make this valley their home. 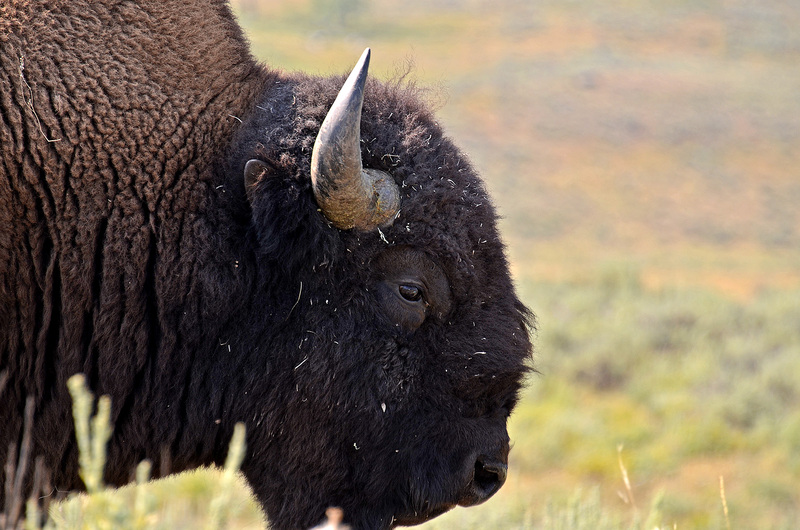 Pam thought this place reminded her of the movie Dances with Wolves, and it was tops on our list for viewing wildlife up close and personal. 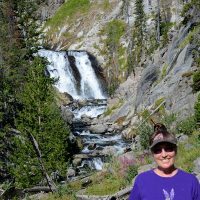 There are a large number of well documented trails for hiking in Yellowstone, lots of wildlife, geysers everywhere, and scenic grandeurs galore. This is our country’s first National Park, and it remains one of the best to visit. One word of caution, however: tourists can be crazy. 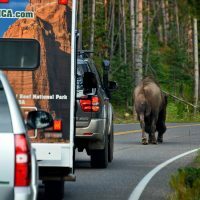 They will stop and park in the middle of the road to jump out and take a picture, relentlessly pursuing wildlife in all forms. Defensive driving is a must, and if you get stuck briefly in traffic, just relax and join the crowd. Very few people seem to be in any hurry here, and that’s not all bad when you think about it. We highly recommend Yellowstone for a trip, its right there near the top of our list. This entry was posted in National Parks, Uncategorized and tagged camping, geyser, Old Faithful, Yellowstone. Bookmark the permalink.